Benay: Good day. I’m Benay Dyor and welcome to another episode of Coach Pep Talk, the podcast for people who run their own coaching businesses. Each week I talked to an expert who shares wisdom that helps us be better coaches and better coaching business owners. This week I’ve got Jana O. On the line and she’s talking to us about how coaches can use Pinterest to generate leads. So I’ll see you on the other side. Benay: Coach Pep Talk has proudly brought to you by Life Coach Office an online service that lets you easily manage your coaching business from just one platform. Some of the features that our clients really love are the ability to manage your client files all in one place, the ability to easily send invoices, and manage your coaching calendar, but the one that takes it’s the icing on the cake is really the ability to set up your own membership site with just a few clicks of a few buttons and have your own online classroom just ready to go in about 10 minutes. So if you think Life Coach Office sounds pretty interesting, the best way to see if it’s gonna be a good fit for your business is to jump on over to our website and sign up for the free trial. You can do that at lifecoachoffice.com. Benay: Welcome back. I’d like to introduce today’s guest, Jana O. And I just thought I’d share a little bit of a backstory with you. But I first met Jana because she stood out. She’s in one of my Facebook groups for online coach entrepreneurs and she always has the most excellent Facebook posts in that group all about cool stuff that coaches can do with Pinterest. So I finally said, ‘Look you know your stuff is so great. Let’s meet and let’s see if we can get you onto a Coach Pep Talk.’ And she said yes. So I’m really excited to have this conversation with Jana and to share it with you. But a little bit about Jana before we get into the interview. She is an ultra-organized Content Manager and Pinterest specialist. She loves supporting online entrepreneurs who have successful well-crafted brands and brilliant content. And she helps them shape and consistently distribute messages that attract their ideal clients. She’s got a bachelors in communications and marketing and she absolutely loves her work. So without any further ado let’s hear what Jana has to say about how coaches can use Pinterest to generate leads. Benay: Hello Jana and welcome to the show. Jana: Hi Benay! Thank you for having me. I’m really excited to be here. Benay: I’ve been having my eye on you for about the last six months in our Online Coach Entrepreneurs Facebook group. Your posts are always excellent. Your content is amazing and you’ve really been getting me to pay attention to like, ‘What is this Pinterest stuff?’ ‘Maybe this is something I should be doing so also.’ I’m so happy to have you here to educate, not only me but other coaches out there who should be taking advantage of this amazing platform. Benay: Yeah. Thank you for being here. So let’s get straight into it and could you just are the stage for us and just for people who are really new to social media you know and you know haven’t quite got their head around all these different platforms because there are so many and you know and more keep being born each year. What is Pinterest, you know in brief and why should coaches be paying attention to it basically? Jana: Sure absolutely. So it at its, the very basic description of Pinterest for those people who may not even have used it for personal use as it is a search engine and it’s a visual search engine. Pinterest itself calls itself a search and discovery tool. So it is by definition a search engine. Someone explained it to me once and it was really helpful to understand if you think about it when you Google something, let’s say up comes all of these different links on the first page and maybe even the second or the third page of Google if you get there. So Pinterest is just like that, but instead of there being words, it’s pictures. So when people search for things on Pinterest, because they’re in the mode where they’re looking to search and discover new ideas and find solutions to their problems, they see photos. And those photos, those graphics represent links. And they can click on those links if they want to and they can click through those links to get to the web page that’s behind that link. Just like as if you were to click on a link on the page of Google when you searched. It’s the same concept but they are photos or visuals rather than just words. So that’s the basics. Benay: I have a Pinterest account and I set it up ages ago and I was really into upcycling furniture for a long time and Pinterest was awesome you could just get all these ideas and tips. Benay: For the business context, how did we then, you know what do we need to shape in our mind and why it’s, how its good for that. Jana: Yeah absolutely. Yes. So you know there are two hundred and fifty million people on Pinterest now, it’s a very fast growing platform. Most of them are women. And I can give you more interesting statistics that I think are really relevant to the coaches and the consultants when it comes to like who is actually on Pinterest. But the people who are there are mostly women, about 80 percent women actually. They’re looking for you know inspiration and ideas. So the thing is is that once set up optimally for your business it can also be a powerful and yet very low maintenance driver of traffic to your content, whether that be leaf magnets, or to content that you’ve created to show your expertise and to demonstrate and provide value to people. So in that way it can be used by coaches, course creators, consultants and those are those are my people, that’s who I specialize in working with, to actually grow their e-mail lists and grow their businesses. So like I said, most people don’t really necessarily think of it right away, which is one of the reasons why it’s starting to really gain popularity. It’s only one of the reasons, but it’s one reason it’s going to gain popularity among the coaches, and the consultants, and whatnot for their businesses. Benay: You know what… for the listeners who maybe have a Pinterest account like me and it never really occurred to them to use it for business, do you have to have two separate personalities on Pinterest or can you combine personal and business together? Jana: That’s a great question. So as far as like the actual T.O.S., like the Terms of Service on Pinterest, it’s very different than on Facebook as an example. You can actually have as many profiles on Pinterest as you want. You don’t have to only have one or have them be personal and business. So one of the things that I help my clients do initially when they’ve decided that they want to have a presence on Pinterest for their business is to decide if they want to actually convert their personal account to a business account or if they want to start a new business account. And there are pros and cons of both. And you know we kind of look at that sort of a few different factors and the way they’ve been using their personal account, and what’s on their personal account, and who their followers are to make a decision about that. But you know the answer, the short answer is yes you can have… You can do either one. You can either combine that or you can keep them separate. Benay: OK. And then I guess when you’re looking for what’s the best strategic fit for what they want for their goals for their business. When you decide? Jana: Absolutely, for… yeah, for example, like yours we may I don’t know all the factors but one thing I know so far is that you might have a lot of pins and a lot of boards about repurposing furniture and you may have followers who found you and like to follow your boards because they’re interested in repurposing furniture. So for that reason, or upcycling, I’m sorry, You know we may, that might be one indicator to me that we might want to start a new account for you. Benay: Yeah. Okay. Okay. Is there a trend? I mean with the business owners and coaches you’re working with like do most of them go and create a new one or do they tend to combine? Jana: It’s about half and half. It really depends on how they’ve been using it. Yeah. It’s about half and half. Benay: OK great. OK. So why are most coaches not using Pinterest and what are some of the reasons you’re finding around that? Jana: Yeah. So I think that the reasons, or the barriers to it, I think fall into two major categories or buckets. The first one is, is that they simply don’t think of it from a business perspective. It requires a little bit of a mindset shift if you’re already using Pinterest, but you’re using it to pin things that are more lifestyle oriented. So a lot of people do still think of it as a place where you pin things about weddings, and things about party planning, and things about recipes, and I certainly have boards on my private account that are all about those things. But so you know people don’t necessarily think of it, but the fact the matter is is that 14 million articles are actually pinned every day as well. So it’s not just about the visuals it’s also about the content that’s behind those visuals. So and that’s every day, there are 14 million articles that are being pinned to Pinterest! It’s crazy. Jana: Yeah. So If you create any kind of long-form content, whether that’s a blog post, articles, people column articles, a podcast, for instance, even YouTube videos that you’re repurposing, you can be pointing pins there and sending them that way. But so people don’t necessarily think of it because it’s not, from a PR perspective, you know it’s not something that people think of Pinterest for essentially. And then, I think the second barrier comes, is that it’s not actually a social media network. And some people call it that, and I call it that sometimes when I’m just sort of speaking about it generally and lumping it in with different strategies for my coaches, and consultants, and course creators who are my clients. But it is not technically a social network. It is a search engine. So what happens… What I see happening a lot, is people, coaches, consultants, they’ll jump on Pinterest and they’ll think OK I’ve heard that this is a really low maintenance traffic driver. I’ve heard that this can work to build my email list, build my business. So they create an account and they don’t really come at it strategically. They just start pinning things and creating boards, and they pretty quickly figure out that you can’t really use Pinterest in the same way that you use Facebook, or LinkedIn, or especially Instagram. A lot of people think because it’s photos and pictures they think of it like Instagram, but it’s not like that at all and so they quickly kind of realize that the same ways that they use those social channels are not going to work on Pinterest and they kind of get frustrated and maybe even a little bit like sad that they invested the time in setting up an account and they just kind of you know abandon it. So it’s pretty typical for me you know some of my clients, a common situation is that someone comes to me and says, ‘Yeah I started it but I just didn’t really it wasn’t getting anything from it, or I didn’t understand how it would work to actually drive traffic or build my business. So I don’t do it anymore.’ So I think that’s the thing. People just don’t really, they don’t understand the strategy behind it and they try to use it like a social network when it’s not. Benay: Yeah OK. So let’s look at what are what are the three things that are the most important to focus on for success with Pinterest, especially for people just getting started. Where do you start? Jana: Yeah. So I think that, if it’s OK with you I’ll just back up and just basically talk about just sort of the basic funnel because I think that really is… that’s something that you need to kind of have an idea of before you know what the major like success factors are. Jana: Ok cool. So I think that you know what basically your ideal client is someone who is on there looking for, they are on Pinterest, they’re looking for a solution to some kind of dilemma. They may have search things before or have repinned ideas from their feeds, or their searches, to their boards that give Pinterest a clue about the things that they’re interested in. Because like I said it is a search engine and it collecting data about them all the time. So you might sell something like a program, or a course, or a one on one service that could help that person with their dilemma that they’re looking to solve, or that thing that they’re looking to get inspiration about. And you want them to find you and your service, or your course, or whatever it is that you offer into the world. So the way that we match up the account with the user is that we keyword, just like you would if you think about like search engine optimization in the general Internet. So Pinterest is its own like search engine ecosystem but we keyword all different places in your profile like five different places, plus we also keyword your pins, which are the graphics that point to your articles, or your content. And if those keywords match up with the things that people are searching, or have searched for in the past, or have repinned in the past, then that content might present itself to that person. Benay: Can I just stop you there? When you think about keywords, is that similar to tags in Instagram? Or is it a different thing altogether? Or keyword search engine optimization? That word has been… when you say keyword your account, what does that mean? Jana: Yeah. Yeah. So I would say it… I honestly I’m not a big Instagram user, so I don’t want to answer that question in a way that wouldn’t be accurate, but I don’t think so. I think it’s more as, it’s more like if you’ve ever had any exposure to search engine optimization for your website, or your blog. Where you’re figuring out what it is that someone may be searching for on Google when you want them to find you and your content. And then you’re incorporating those keywords into your profile on Pinterest, or your website if you’re talking about Google SEO. Does that…? Benay: I think so. So from my business, it would be things like coaching tools or developing your signature program, be something like coaching software. 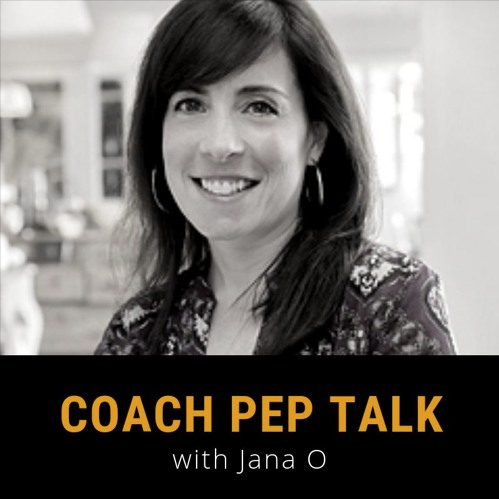 Jana: Right coaching software would be a good one. Yeah. Benay: That always surprises me. Do some digging. Benay: Got that word from Google, so I was surprised. Benay: Okay thank you for clarifying what the keyword was. So you were describing the funnel. You were saying you look at your in there you want to find their ideal clients and they’re looking for a solution to a specific problem in Pinterest. And of course, your clients have the answer to solve that problem with a coaching set, a program, or consulting service. And then can you take us from there? Jana: Yes yes. So the beginning of the funnel if you will is that eye-catching on- brand pin graphic. So designing a pin graphic that is on brand for you and really irresistible and maybe even previews a freebie that that person may get or previews the content that is in the article that you’re pinning that might help them solve their problem or give them information about something that they’re that they’re needing. So then ideally what we want to do is give that person an incentive to click through that pin and then consume that piece of content. So you know listen to your podcast, read your blog post your article, watch your YouTube video. And then that’s where your funnel and your nurture sequence would take over and they would hopefully do whatever it is that you are hoping they’ll do when they listen or read your content, which for most of my clients is to opt into their email list. So that is the… That’s the basic, you know the funnel. So because of that, there are the three things that I would say that are the most important to answer your original question, would be the stand out branded visuals, and I can talk a little bit about what is important when it comes to Pinterest graphics. That would be number one. Number two would be the keyword research and the keyword optimization, which we started to talk about a little bit because if you put a great looking attractive pin up there but you don’t include any keywords in important places in your profile and in your pins, it will be difficult for anyone to find that pin when it’s time for them to need the solution you offer. Jana: Yeah. And then the third thing with Pinterest is consistency. Because Pinterest likes it when your account is consistently pinning and it wants you to be kind of like pinning new pins and old pins, all day every day. But the great thing of course and I’m sure you can see this coming a mile away, is that there is a really really good low-cost scheduling software that allows you to bulk schedule all that content in one sitting every month, or every quarter, so that you don’t have to actually be on Pinterest all day every day, because who has time for that, in order to be consistent and pin enough for the algorithm to reward you by showing your content to your audience. So I’d say those are the three things that would be the most important to rely on. Yeah. To really hit out of the park. Benay: Yeah that’s a really great starting point list for everyone. So stand out visuals, keyword research, and optimization and consistent pinning. And did you want to go into detail on each of those three? Jana: Sure I’d be happy to. So as far as the visuals you want them to be obviously attractive. So any design experience that you may have comes into play. That being said you know a lot of times the pins that do the best on Pinterest for my clients tend to be the simplest ones. So you don’t have to be like a design whiz. I do all my design for my clients. For example in Canva, and I keep them quite simple because that tends to be what does the best. Jana: But you do want them to be attractive. Benay: Before we move on I’ve started using Canva. I think in the last year or so but I had avoided it for a long time. For some of our listeners, you know I don’t know Canva at all. Can you just give a little pitch for Canva? Jana: Sure yeah. Oh absolutely. It’s like gosh, one of my favorite tools. Jana: It’s so great. Canva is an online graphic design software and it basically is for non-graphic designers. So, for instance, I have no graphic design training and I am not the most technically savvy person. My strengths are much more like creativity and content creation, but it is very easy for me to use. So it’s just a very streamlined graphic design software that you can learn to use and make graphics and one of the greatest things about it is that you can use it for free. There is a paid version, but the free version is enough for most people, I would say most online entrepreneurs. Benay: It’s amazing. Well, you’re your graphics. It’s interesting you say you’re not a graphic designer because your graphics that you post in our Facebook group are just stunning. They’re always stunning. Jana: Oh thank you. Thank you so much. I have I’ve gotten better at it. I’ll say for sure. Benay: And I just want to add in two people who are thinking about oh this Canva thing sounds interesting, it’s canva.com and I’ll put a link to it in the show notes. And it just it’s really great because you can just click on a pre-existing template you can drag that in and then you can change the colors, change the picture change the words, and then its kind of pre-designed for you, you just put in your stuff. So it’s really really easy. So if you haven’t, if you’re not using it get in there, you’re going to be left behind. Jana: It is a super software for sure and so easy. And so it’s so free. It’s free. Benay: It’s free. And I don’t have to use, I mean I just make some Facebook stuff on there and maybe some workbook covers every once in a while. And I don’t need the paid version yet. Benay: So there you go. OK. So back to visuals in Pinterest. They need to be attractive. They need to be simple. What else? Jana: Yeah yeah. So we definitely want them to be the right size or the right I should say dimensions for Pinterest. So Pinterest wants them to be a 3, I’m sorry, a Two to three ratio. So I use 600 by 900 pixels as an example. So that’s a little bit different. They’re not the same dimension as you would create for other visibility channels if you will. I’m always I always don’t, I don’t say social you know social media network lightly. And you know you want them to be legible, I know that sounds obvious, but it’s crazy how often I see pins that you can’t even read. It’s like how are going to entice people to click if they don’t know what they’re reading. But because the most important KPI, key performance indicators what I mean by that, for my clients is going to be clicks through to their Website. So we want them to be tempted to do that. And so with the branded, the stand standout visuals, I think I heard someone say and it really stuck with me that you have to think of them like a billboard on the highway. A pin is like going to be if you’ve been on Pinterest you know you’re going through your feed quickly and certain things catch your eye and certain things don’t. You have to be able to make them simple enough and have the font large enough so that if someone were driving by them on the highway just like they’re scrolling quickly through their feed that they would quickly be able to process what you know what your pin is about. So that’s always sort of a guideline that I use. Jana: That’s the visuals. We talked a little bit about keyword research and keyword optimization, but is there anything that you think would be helpful to your listeners for us to add to that? Benay: Well you mentioned that you have to put it in a couple of places. So I think you mentioned in your profile and then of course in your pins. Is there any other important place? Jana: Yeah there are five places in your Pinterest world that you want to make sure are keyword optimally set up. That’s not the right phrase. That are keyworded, you know what I mean.The first one is the title or name of your profile. So, for instance, you want to include your name, or your brand name, but also a little bit like just a couple of keywords about what you do in the actual title of your Pinterest profile. The second place is your bio. So you have a little bit of you know a little bit more space underneath your name to actually be able to explain to people what you do, who you can help, but you want to make sure that you’re doing that in a way that is keyword optimized. So you want to add at least one or two if not three of your most important keywords to that area, the bio. The third place is the Pinterest board titles themselves. And that’s actually a very common error that people make when they’re setting up their accounts, but it’s easily solved because you can always change the title of the board. But people will often come up with sort of cutesy or creative names for their boards. Like an example would be like if you’re a food blogger and you know you blog about the Paleo diet, instead of creating a board called paleo desserts, is that a thing I don’t even know? I don’t know if there are. Benay: Yeah I’ve got a great caramel paleo dessert. It’s amazing. Jana: OK. All right cool I’m just totally like winging it right now. So instead you create something that says like you know desserts that I can eat or yum yum yum or something like that. Benay: Aw yeah, nobodies going to search for that. Benay: Let me search Yum yum yum, And then let’s see what comes back. Jana: Exactly. Exactly. So yeah you’d actually want to just call your board paleo desserts not yum yum yum. Yeah. And then the fourth place, if I’m counting correctly, is the board descriptions, which a lot of people miss as well. You can create a board description of up to 500 characters and those are very important keyword real estate on Pinterest. And then the fifth place is the individual pins. When you create and post your pins you want a keyword optimize those as well. Benay: Great. I just I’m curious about you said for the title and the name of your profile. So would you’re having a business account, so my business is Universal Coaching Systems would I put a keyword in there plus my business name? Jana: Yeah. You’re limited in terms of the number of characters and I can’t remember off the top of my head how many because they just changed it again. But you do you want to have your name or your brand name, and then like a dash or a line is typically what people do. And then something very brief that’s a searchable keyword for you that describes who you are. So it can be a little tricky to pick it and you are always sort of balancing the keywords against you know your brand and the things that you like, the words you like to use in your brand. Yeah but yeah like coaching systems would, you know if you find that that is a keyword during your keyword research that is is one of the keywords you want to rank for on Pinterest. That would be a great one too, to indicate let’s say. Benay: I’m just thinking of some of my clients because I work with coaches and help them you know write their signature programs and some of them have very long business names, so if you have to fit your business name and a keyword that’s an interesting challenge. And I guess they need to focus on their niche, or? Jana: And that was enough so that the characters yeah we could fit that in there. We had to shorten her last name. Benay: But you can be creative I guess with that. So it’s not like I guess Facebook where you have to have your, where you should have your full business name or…? Jana: Right yeah. You can. You can be creative about it for sure as long as. Yeah. I mean it should have your name if you… It doesn’t really have to actually now that I think about it you could create one with the name of your company as well and then a keyword. Benay: OK cool. All right. So let’s see the last point for the, when we were talking about the three things that are most important to focus on for success in Pinterest was consistency. I know it sounds pretty self-explanatory but is there anything else before we wrap up that you want to say about consistency before we before we close? Jana: I don’t think so I think just it definitely if you’re going to spend time setting all of this up optimally don’t skip out on scheduling, you know getting on board with Tailwind, which as the software that we use. It’s either ten dollars or fifteen dollars a month depending on how you choose to set it up, as far as the payment plan. And it’s just really instrumental in making sure that that third pillar or that third leg of the stool is in place so that you’ll all the work that you’ve put into your account will pay off because you’re being consistent. Benay: And we don’t want it when you come to doing your pins are you just repurposing the content that you’ve got in other places? Like you’re repurposing your blog post, you’re repurposing your YouTube channel videos, or are you repurposing your podcast? Is it is it that sort of thing? Jana: Yeah it is definitely, you’re I mean you’re not really creating new content for Pinterest, except maybe you’re creating a graphic, but you’re pointing your pin to existing content. So yeah absolutely it’s definitely a repurposing strategy. Benay: Yeah. And with the Tailwind, the software the scheduling software you refer to is it is it Pinterest specifically or does it cross other platforms as well? Jana: Yeah. It was designed originally for Pinterest but they do actually offer an Instagram scheduling piece of it now as well. I have not used it myself because I’m not an Instagram person but I heard some people talk about it and you know they do it. It does meet their needs for their Instagram scheduling. Yeah. Benay: That’s wonderful. Well, thank you so much. This has been a very thorough introduction to Pinterest and I hope that it’s inspired some coaches to sort of get on the Pinterest bandwagon. It sounds like you know what those simple points that you’ve laid out that it’s really quite doable if your just sort of strategic about it and follow those key steps. So thank you. Jana: OK. Yeah. I mean it’s really like you had mentioned, it’s a repurposing and you do your pins are evergreen. So when you create pins they don’t just disappear in like a fast-moving news feed like they might on a social network. So on Facebook for instance you know you’re lucky if a post will be seen by people from your Facebook page for more than a day or two at the most, on Twitter or tweets lifespan is literally minutes. But on Pinterest when you take the time to create that graphic and point it, you know keyword optimize it and point it to your content, you literally you know you can benefit from that for months and years to come in fact sometimes it takes time for that pin to gain traction and it’ll be doing really well for a month and then it’ll just do really well like a year later. So Pinterest traffic really snowballs over time so it doesn’t, it’s evergreen, which is really great when it comes to you know work-life balance. So and the other thing that’s great about it is there’s very there’s no pressure to like rack up followers on Pinterest because when you do the work to keyword optimize your posts, your pins excuse me, that’s how people are going to find you. In fact like ninety-five percent of the people that find your pins are not your followers on Pinterest. So it’s very different then like on Instagram or on your Facebook page. Benay: That’s… Yes, go ahead. Jana: Sorry. It can, it just can be really low maintenance, which I know you know when people get to the point where they’re experiencing a certain amount of success but they need to find ways to kind of streamline certain areas of their business like lead generation as an example, you know it’s something that people start to look at and think hey you know I can see why it’s so beneficial because it is can be very low maintenance. Benay: Yeah well it’s it’s really interesting that the podcast that I recorded before yours is with a gentleman who is a search engine optimization expert and the similarities in the strategy behind you know optimizing for Google and optimizing for Pinterest, it’s fascinating. Really I see the search engine coming out and what I really love about it is that you are creating assets, long term assets for your business. And for me I’m always looking for that 80 20, you know what can I do the least amount of work to get the longest amount of returns to keep driving a product. Benay: OK. So I guess I’m definitely going to be looking further into Pinterest. So thank you so much for setting the scene. So there is this question I do like to ask all of my interviewees, I don’t think I told you about it but, Pinterest aside or you can include Pinterest if you like, but what is the number one piece of advice that you would give to coaches you know that are starting out or even that you’ve been running their business for a while, What is that number one piece of advice that you would like to give them today? Jana: I immediately know what that is. Jana: It’s about Pinterest but it’s also about business in general and I would say niche down. You never know who it is that you can serve at your highest and best and just double down on that because it makes everything easier. It make sales easier, it makes the systems that you setup easier, and it helps you to serve people in a much more impactful way. One little microcosm of that is that it helps you get traffic on Pinterest because if you know who that is and it’s a very niched group for instance, like the people that my, the coach that helps people with Lyme disease, the one that I just set up, before that I did an online dating coach Pinterest profile. If you know who you help it just it makes everything easier and it helps people know who you are and helps you know really your messages resonate. Benay: Yeah I totally 100 percent agree with that. I’m always telling my clients let’s find your niche, let’s find your niche because you get clarity, you can become the authority, you can become the expert. Benay: Anyway I think that message is finally sinking into the community. When I first came out with it about five years ago people were resistant but they’re starting to buy into it a lot easier now. If people want to learn more about you, maybe get some great new tools for you, I think you’ve got a checklist or something that you can share with us? What resource do you have to share with our audience today? Jana: Yeah absolutely. I do. I provide ‘Done for You Pinterest Setups for Coaches’ like soup to nuts, but I also have this checklist which gives people like it’s like a three-page checklist. So it’s pretty detailed. But it basically gives you a list of all the things that you would need to optimally set up your own if you want to DIY your Pinterest, which is totally possible by the way. It just involves time and some a little bit of you know just following these steps. So you can get that at my website which is Janaomedia.com/pinterestchecklist. So janaomedia.com I guess it’s a forward slash right, pinterestchecklist. Benay: I’ll put it in the show notes, done worry, it’ll be right there. Jana: OK. Someone corrected me the other day, I was like I have been saying that for years. So it’s just Pinterest checklist. Benay: So I just say slash. You can decide. Jana: That’s a really good idea. Benay: Wonderful. OK well, I’ll make sure that’s in the show notes so people can go over to your site and grab that. Jenna thanks so much for coming onto the show and sharing your wisdom with my audience. Jana: You are so welcome. It was really fun. Thank you for having me. Benay: And thank you, listeners, for listening to another episode of Coach Pep Talk. Please go in like the show on iTunes and SoundCloud that just spreads good karma for us. We really appreciate it. OK. Have a great day everyone. And happy coaching.